Shopping Pilgrim’s Bulk Department affords you the chance to buy only what you need, and even try something new while saving money! Bulk foods also promote reduced packaging and lower distribution costs to our “remote” Coeur d’Alene area. Pilgrim’s Bulk Department offers natural grocers something for every budget, diet and taste, including local, vegan, vegetarian, dairy free, Non-GMO Verified and gluten free. In fact, our bulk gluten free baking mixes, flours and sweeteners are separated from the rest of the bulk bins for your safety and convenience. We even have an array of spices and loose leaf teas, along with tea and coffee brewing and grinding accessories to make your healthy kitchen and culinary experiences complete. Our Bulk staff work every day to offer you the greatest variety of healthful foods and services available. 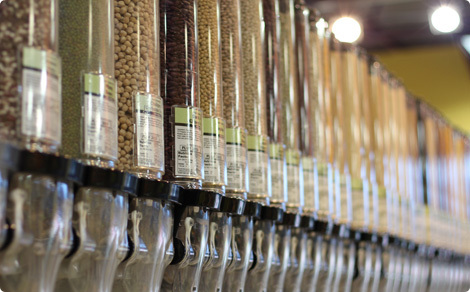 Come browse Pilgrim’s Bulk selection and discover what bulk foods can do for your pantry.